In New York, in the early Sixties, I experienced my first encounter with the work of Joseph Cornell, the pioneer of an art form consisting of box frames filled with arrangements of found objects that delights the eye with their gentle surrealism. 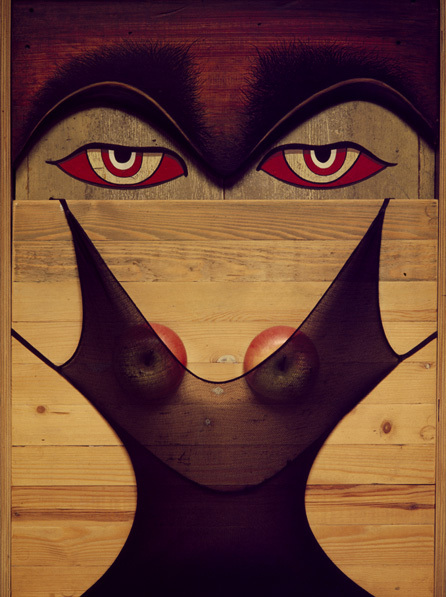 This happy meeting inspired work I did many years later in my Heart Icon and Apple series. In those early days we used terms like Collage or more accurately Assemblage to denote Mr. Cornell’s activity. Sadly, those solid, descriptive terms have now been superseded. The academics have got hold of the concept, they delved into their French and old Italian dictionaries and came up with BRICOLAGE. Those that indulge in this dark art are to be known as BRICOLEURS. What tosh. And what’s more. In the Fashion press, photographers have become Lensmen who no longer photograph their models.... they lens them. Poor dears.